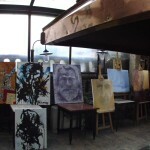 I am invited for a second time to join the De Niro International Art Colony in Bitola, Macedonia. This time I am joined by Katrina Sadrak who, for a while, shared our studio space in the old art college on Church View. Alongside us in the colony are artists from Macedonia, Montenegro, Bulgaria, Slovenia and Italy. The 10 days include plenty of studio time as well as several visits to places of interest and a closing exhibition of the works created. The colony was well covered by regional and national TV as well as several newspapers with Katrina and myself being a focus of much attention as ‘Internationals’ from outside the Balkan States. My book “Two Weeks in Macedonia” created a great deal of interest in the interviews. Many friendships were made and invitations offered to future colonies. Oh – and we did some painting too!